The College of Health Sciences has the mission of providing outstanding preparation for careers in the health sciences and as health care providers. 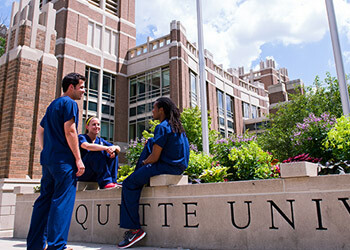 It is dedicated to improving health care delivery by educating excellent, caring and ethical health care professionals through a rigorous program of teaching, research and service. Our programs of study emphasize critical thinking in the context of clinical and scientific problem solving. Students are instilled with the Jesuit ideals of concern for the physical, emotional and spiritual development of the individual, as well as a lifelong commitment to leadership and learning in the advancement of their personal skills and professions.